Perhaps this is what goes through the mind (if they’re even thinking) of a shoplifter before they drop that lipstick into their pocket and try to walk out of the Exchange. The fact is, shoplifters are hurting not only themselves with the inevitable punishment, but the entire local Southeastern Hub community. 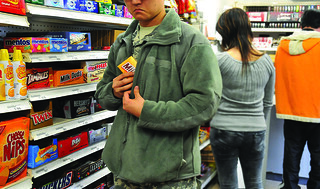 “Shoplifting is not simply a prank; it is stealing – a crime,” U.S. Army Garrison Daegu Commander Col. Kathleen Gavle said. “USAG Daegu works with store managers, community and unit leaders, and law enforcement to deter shoplifting and to deal appropriately with those who do steal. While shoplifting incidents at Daegu and the resulting costs to the military community were down last year when compared to 2010 ($1,241.28 compared to $2,685.22) this year there has been a recent spike in shoplifting incidents. Typically merchandise such as cosmetics, electronics and video games are targeted by shoplifters. According to Henderson, an abundance of shoplifting prevention measures such as “eagle-eye” Closed Circuit Televisions with DVR technology, expanded use of high-tech Electronic Article Surveillance, an alert staff, proper layout of counters and display of merchandise and an aggressive youth awareness campaign are in place in order to decrease the possibility of shoplifting incidents. There is no typical shoplifter and there is no way around the fact that shoplifting is stealing. There are heavy consequences too, including being arrested and possibly charged with a crime. If shoplifting is suspected, the Daegu Exchange’s Loss Prevention office turns the matter over to local installation law enforcement. In addition to possible disciplinary action and or criminal prosecution, the Federal Claims Collection Act allows the Exchange to enact a flat, administrative cost (Civil Recovery fee) of $200. There may be further fees, in addition to the Civil Recovery Program-- depending on the condition of the stolen merchandise. Shoplifters may possibly face further civil actions to include a loss of Exchange privileges for up to six months. You can contact Henderson at 764-5171 to arrange an eye-opening tour of their loss-prevention capabilities.